Uranium 233 derived from spent reactor waste is often contaminated by Uranium 232 when Thorium 230 gets bombarded by a second neutron, but in a particle accelerator this process does not have time to occur and thus U232 contamination is as low as one part per million and thus as safe to handle as weapons grade Plutonium. According to speech notes recently uncovered in KGB archives, Heisenberg advocated harvesting Protactinium for a nuclear weapon at the Harneck Haus conference in July 1942. Later whilst interned at Farm Hall Cambridgeshire after the War, Heisenberg also identified harvesting Protactinium as one of three methods of obtaining fissile material for a nuclear bomb. The other two of course, being to either enrich U235, or to reprocess Plutonium from spent fuel in a thermal nuclear reactor… Our history books tell us all about these other two methods in Nazi Germany but are strangely silent on the Protactinium harvesting project. Why is that? The wartime Chairman of AEG, Herman Bucher revealed to OSS informant Erwin Respondek that his company was funding development of a Heavy Particle Accelerator for the Atomic Bomb Project at Bisingen. The process harnessed the fluorescent quality of Mercury to cause collisions between electrons and photons, which in result released thermal neutrons. The device was surrounded by a concave beryllium mirror to reflect neutrons back into a mass of Thorium oxide placed at the core. The machine generated this X-ray plasma in orbit around an axle which spun two carefully frequency phased contra-rotating drums. Respondek also revealed to the OSS that Heisenberg worked closely with Swiss engineer Dr Walter Dallenbach at a secret facility known as “Forschungsstelle D” at Bisingen to develop the Nazi bell. A report by the OSS in November 1944, cited information from an engineer named Nagglestein who related Otto Hahn’s laboratory at Tailfingen in a town close to Bisingen was using Thorium to obtain Uranium for an Atomic Bomb. Inside the Bell was located two contra rotating drums. Norwegian born physicist Rolf Wideroe wrote in his autobiography about development of the Bell at Hamburg, by the company CHF Muller. In his patent his diagrams showed one sphere inside another spun on a common axle. As is common with particle accelerators a vacuum has to be created to propagate plasma inside these evacuated chambers. Then heated mercury vapour would have been bled into the cavity and then once spun up subjected to powerful discharges of electricity to ionise the Mercury. Under this influence the Mercury would fluoresce and photons would collide with extremely energetic electrons, creating Gamma X-rays. These X-rays in turn would stimulate the Beryllium oxide in the Xerum 525 to emit thermal neutrons. In turn these thermal neutrons would be absorbed by the Thorium 232 changing it into Protactinium 233. Wideroe called this device the Wirbel-Rohr, or Vortex Tube. Patents for variations on the same theme had been applied for in 1935 by both Prof Max Steenbeck and his rival Swiss scientist Dr Walter Dallenbach. After WW2 Steenbeck co-operated with the Soviets to replicate the Nazi Bell. The Soviets named it the Tokamak. Mercury (alternate accounts say amalgams of Mercury) were spun inside these drums. In likelihood the Mercury was introduced from beneath as a heated vapour. Jelly like compounds of Beryllium with Thorium were located in flasks contained within the central axis. The Nazis were known to have made special paraffin from Deuterium (heavy Hydrogen) because of it’s catalytic qualities in radioactive exchanges. Mercury also played a role by releasing photons into the plasma. It is the collision of energetic electrons with photons which gives off gamma radiation. 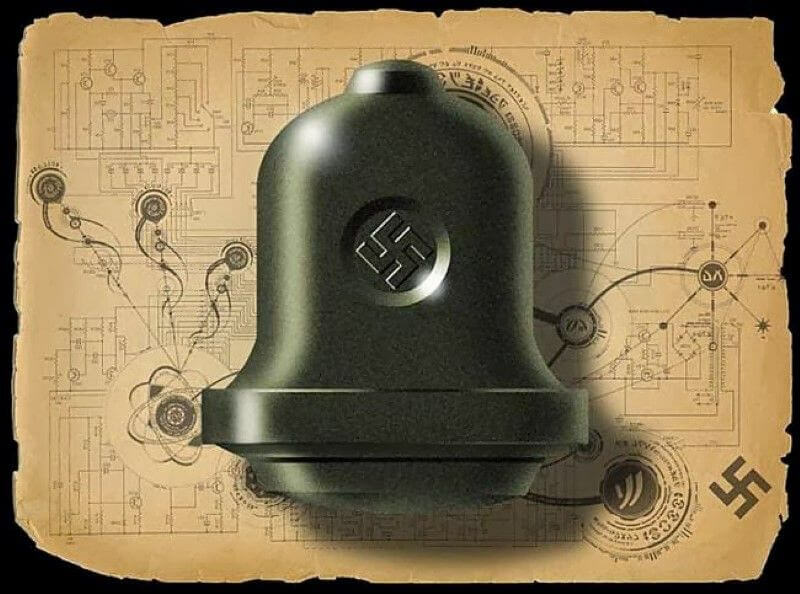 Beryllium compounds used in the Nazi Bell were called “Xerum 525.” During WW2 Nazi scientists discovered paraffin was useful as a moderator in reactor experiments. Paraffin would fit the description of “Xerum 525″ as a pinkish jelly like substance. Pink colour possibly came from the mixing of Mercury (II) Iodide also known as Red Mercury into the compound, thus by implication Xerum 525 most likely contained Beryllium and Thorium suspended in heavy paraffin. The Nazi Bell was initially housed in a basement beneath the Charity hospital in Berlin and thus the project was known as Charite Anlage. From November 1943 the Nazi bell was housed in an underground laboratory beneath Gandau airfield on the western outskirts of Breslau, now known as the Polish city of Wroclaw. Xerum 525 compounds were supplied from a laboratory in the city of Danzig now known as Gydina. After operation the spent and altered compound was reprocessed at a laboratory west of Breslau then known as Neuberg. It was shifted from Gandau in November 1944 to Furstenstein Castle and later in December 1944 located inside Wenceslas mine. Following the war Professor Manfred von Ardenne led two Soviet scientists Nicolai Flyerov (aka N.I. Frolov) and Igor Kurchatov to the Wenceslas mine and gave them a description of installing what he called a cyclotron in the mine. This mine was abandoned before the war. Above ground there was a power station with two steam cooling towers. The bases of these have become known by various names like the “Henge” after Stonehenge, or the Fly Trap. Bizarre claims are made by some that these are related to Nazi UFOs. Near the mine entrance Nobel Dynamit AG operated a bullet manufacturing plant. Wenceslas mine was also known by it’s codename Komplex Milkow. A short distance away was Ludwikowice. The area in wartime had been part of Germany’s Silesia region, but after the war most Germans were forced into East Germany and their homes were turned over to Polish refugees. In German the village was called Ludwidsdorf. A constant criticism of the Bell story is that it is a myth based entirely upon the unverified claims of Polish author Igor Witkowski. In fact there are others who contribute small portions of the story who are also witnesses to the Bell at Ludwikowice. SS Hauptsturmfuhrer Rudolf Schuster, from interrogation report at Berlin Document Centre about evacuation of the Bell by air in 1945. Soviet plasma scientist G.N. Frolov in 1983 interview referred to Prof Baron Manfred von Ardenne as first hand witness. Other individuals who may not have first hand witnessed the Bell device itself have also contributed to understanding the project surrounding the Bell. Dr Ronald Richter strove to recreate the Bell project in Argentina after the war and the dismantling of his Bell device under political pressure applied upon Argentina in 1952 grant further insights. It is also worth noting that Ardenne disclosed to Frolov that whilst Ardenne had installed one cyclotron like device in the mine at Ludwikowice, he said there was already another one inside the mine. At Bissingen in April 1945 the French captured what appears to have been another, incomplete Bell device created by the Swiss scientist Dallenbach. When ALSOS reached the Austrian town of Melk they came across another nuclear project with what was termed a transformer room. Dr Rolf Wideroe after the war referred to a device known as an X-ray transformer which also appears to be the Nazi Bell. At least four such devices may have existed including Bells at Melk, Bissingen and Ludwikowice. Furthermore a giant underground transformer room at Jonsthal may have contained yet more Nazi Bell machines. The contents of Jonsthal remain classified by US authorities. The Nazi Bell is intimately connected with the work of Swiss Plasma physicist Dallenbach’s work with Forschungsstelle D. Dallenbach was contracted by AEG and his laboratory was located at Bisengen in Germany just north of Zurich. Dallenbach scrupulously avoided giving any impression that he was anything other than a neutral during the war, however he was a fervent Nazi and several slip-ups by Nazi officials and his own deputy, revealed that he was working on an atomic bomb project vital to Germany’s war effort. Dallenbach himself maintained his work was pure research yet during his time in Germany the Nazis refused to fund any scientific work not vital to the war effort. By protocol of the Army Weapons Office session of 21.7.1942, this project was awarded the priority classification “Kriegsentscheidend” – decisive for the outcome of the war – the highest known category of secrecy and funding priority known in the Third Reich. No other known project had it. The electrical giant AEG provided the huge amounts of electrical power under the contract code-name “Charite-Anlage”. The code name Charite-Anlage co-existed with Project Thor. Priority classification was invoked for the Bell with the Gestapo in 1944, quoted as SS/1940. This classification was cited seeking the release from of engineer Richard Cremer from a 2 year sentence for defeatist attitudes. The name Charite-Anlage applied specifically to electrical engineering and manufacture of the Bell itself and the supply of power. Another code name associated was Der Laternenträger (Lantern Bearer), a loose metaphor for the Light Bearer, Lucifer presumably refers to medical and biological experiments with radiation. It may also refer to the weaponisation of nuclear material produced by the Bell.Der Laternenträger research was based at Furstenstein Castle according to Gross Rosen camp survivour, Professor Mieczyslaw Moldavia. According to Prof Mieczyslaw Moldavia, other Researchers at Furstenstein Castle were also investigating and testing pressure suits for a manned V-2 rocket, known as the A-9/A10, part of a manned two stage rocket for attacking New York. Rainer Karlsh’s book, Hitler’s Bombe relates that a team of physicists from Leibig University at Giessen carried out a lot of research at Ludwikowize, which is where the Nazi Bell was located. Sporrenberg commented on various animals and personnel dying horrible deaths after exposure to the Bell. He said their flesh would liquify. Giessen is north of Frankfurt am Main and it’s research appears focused on genetics and biological research. Was this ghastly research to discover what radiation could do to Germany’s enemies? The project was also known as Kronos (Saturn) which refers to spin polarisation plasma physics. Thus it could easily be inferred that the rings of Saturn represent the plasma torus inside the Bell. The Bell exploited spin polarisation of atoms to create a plasma, it would be entirely fitting to apply Kronos to Gerlach’s scientific role. The final, but the most well known code name was Die Glocke. The meaning behind this code name or it’s association is entirely unclear. No credible satisfactory explanation of the Bell’s purpose has ever emerged and indeed it’s very existence is still disputed. Facts would suggest however, that the Bell used a hitherto barely mentioned alternate method to acquire fissile Uranium for Atomic weaponry. A photo-chemistry method mentioned in secretly recorded conversations between Nazi scientists interned at Farm Hall near Cambridge after the War. At Farm Hall after the war, captured Nazi nuclear scientists repeatedly referred to obtaining fissile material from a photo-chemistry process. Our history books are silent on this method. As I hypothesize this device worked, vapourised Mercury was spun in a magnetic field to provide excited electrons. Mercury is known to fluoresce easily. Under the influence of an elctro-magnetic filed electrons would disassociate from their atomic nucleii and would swirl around the machine much like a doughnut shaped plasma (toroid). As photons collided with free electrons those collision would generate X-rays. The spinning of these electrons, probably in an evacuated low pressure chamber with just small amounts of mercury vapour, would lead to faster and faster speeds. With each rotation more and more electrons would be stripped from the Mercury perhaps causing double and triple ionisation. Plasma is an electrically induced state of matter beyond those which we are normally used to, like solids, liquids, or gas. We have all see Plasma. It is present in Lightning. During their incarceration at Farm Hall scientists, Gerlach, Diebner and Harteck all referred to the photo-chemistry method for obtaining fissile uranium, yet historical accounts of World War 2 remain utterly silent on what the process was which they referred to. Whilst the science of photo chemistry is understood, the role it played in Nazi science is not mentioned and remains classified. Photochemistry relies upon ionisation of an intermediary element to create a plasma. In this case using Mercury. X-rays would be generated from the ionised plasma. Sporrenberg referred to use of Beryllium oxide inside the Bell centrifuge. Beryllium is known to donate slow neutrons when bombarded by X-rays. So how is that useful? It is worth noting, there are slow neutrons and fast neutrons. Fast neutrons are only useful in fission for the splitting of atoms. What it appears the Nazis were attempting to achieve was fusion ,or the adding of neutrons and protons to Thorium 232 to transform it into Uranium 233. An element is defined by the number of Protons in it’s nucleus. Normally the number of Protons and neutrons are the same, but in an isotope the number of Protons remains the same, but the number of neutrons can vary in a small percentage of atoms. This could be excess or lower numbers of neutrons. For Thorium to transmute to Uranium requires taking up extra protons. When Protons are emitted that is called Beta radiation. Thorium has only one naturally occurring isotope therefore when converted to Uranium it would be relatively free from impurity. This is another important factor for building atomic weapons because more than 0.5% contamination renders U233 impossible to use in nuclear weapons. Sporrenberg mentioned Xerum 525 placed at the central axis of the centrifuge. From his descriptions we can postulate that Xerum 525 was probably paraffin impregnated with Beryllium oxide and Thorium oxide. Sporrenberg mentions red mercury which is Mercury (II) Iodide. This would have caused the red or pinkish colour which the jelly had. Red Mercury scintillates under X-rays and is used as a super-conductor.